Sing art is great way to add some distinctive style statements to the house decor especially the embellishing of the walls. Making a sing art with your personal favorite words, signature or shapes would add a stand out and unique touch the beauty of the blank and boring walls of any section of the house. 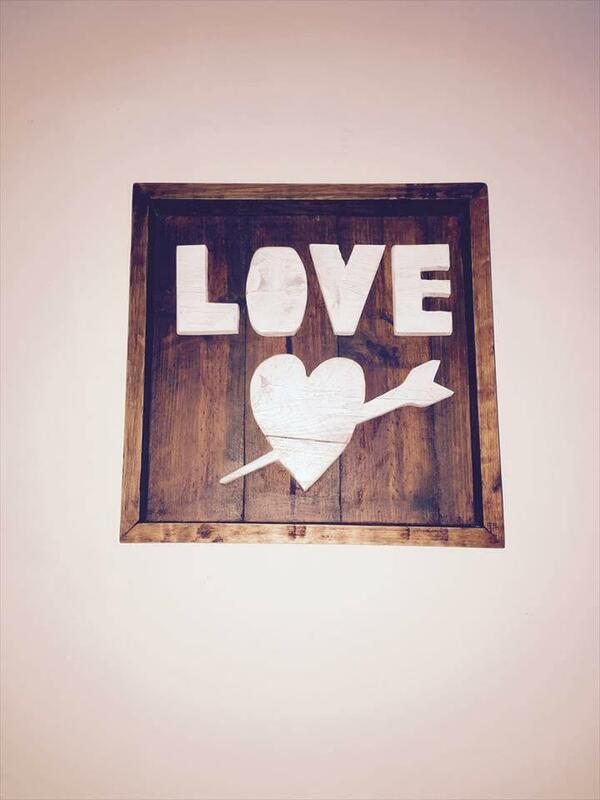 And to make to meet a gorgeous and inspiring pallet furniture in this regard we are here with this DIY pallet love sign art having wooden stenciled word LOVE and a heart with stabbed arrow in it. The sign looks really interesting and charming attracting the onlookers to have a glimpse of its appealing design. 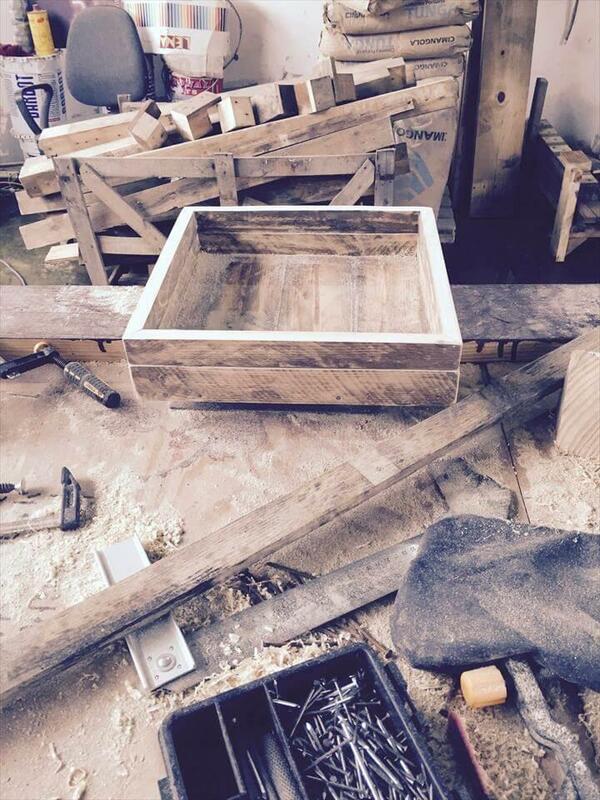 And you would get a big jaw drop knowing how simple and easy it is to make at home from the handy pallets. 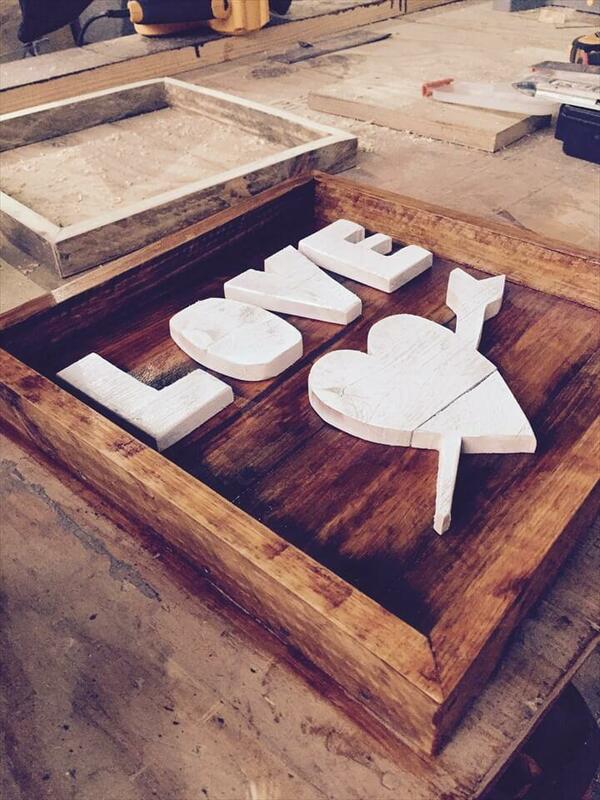 Built a tray like frame ,carve out the word LOVE an heart shape, stain then in white and then glue these signs on the frame and let it dry and you are done. Making it display on the walls would create a visual pleasing sight in your house. This gorgeous pallet wall art sign is sure to allure every one who has taken a glimpse over it and you all can get this lovely wall art piece totally at cost free rates using the pallets. The very first step to make this beautiful pallet sign art piece is to shape up this tray like structure using the customized pieces of the pallet slats or planks and it is really simple to do that. 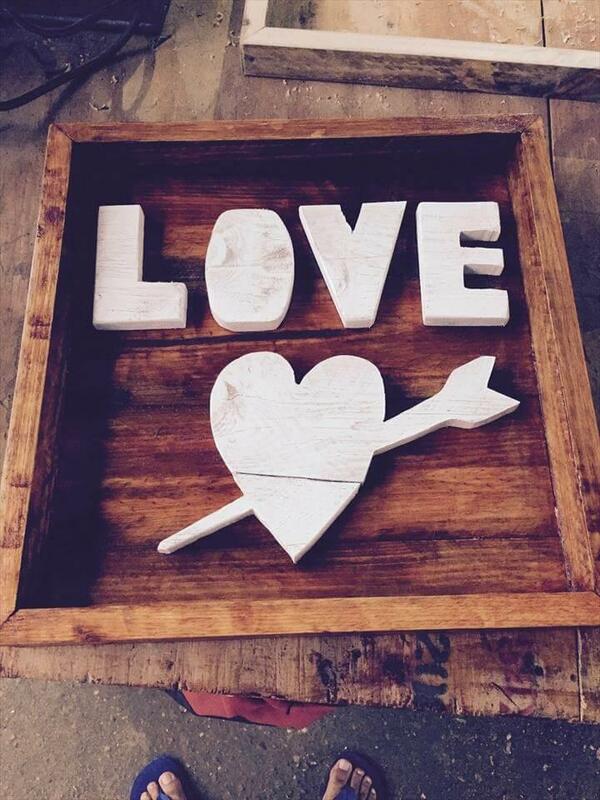 The word LOVE and the heart shape with stabbed arrow in it would be carved separately from the pallets and then getting stained in white would be glued to the former made tray like frame. The frame of the pallet sign art has been stained in rustic brown shade and the signs has been coated with white paint and thus creating a really dazzling and striking color contrast which would add charm and character to your walls for sure.